Just Released! Kid Nepro Arturia Prophet V Collection. A cool mix of 100 new virtual analog patches that will spice up your Arturia Prophet V. This is our 4th release for Arturia’s V Synths following the Minimoog V, ARP2600 and Moog Modular V sound libraries. Included are 40 Prophet-5 Patches, 40 Prophet-VS Patches and 20 new Hybrid mode sounds which bring this collection to a new level in virtual analog sound. 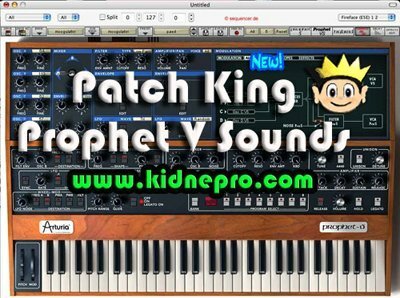 The Patch King has owed several different Prophet’s over the last 30 years and still has a Prophet VS rack in the studio. The collection of sounds that Nepro has programmed for the Arturia V collection is done with expert care from someone who knows the Prophet-5 and Prophet-VS very well – so you can be sure that the sounds are well crafted and sound great. One of the great things about the Prophet V is that you can import sysex files that were programmed on the original Prophets. We then took our original Prophet-5 and Prophet-VS sound collections and imported the best patches to use as a starting point. The patches were then tweaked using the new Prophet V parameters using the added modulation routings as well as the new delay and chorus effects using the joystick and aftertouch – none of which were on the original synths. The Kid Nepro Prophet V Collection is available as a download via free e-mail delivery. Just open the file in your Arturia software and your ready to roll! Available for only $25. USD. Or all four of our Arturia V collections for only $80. Get Kid Nepro’s Arturia Bundle Collection containing new sounds for the Minimoog, ARP2600, Moog Modular & Prophet V sound libraries for only pennies per patch! 400 new sounds for only $80. USD.